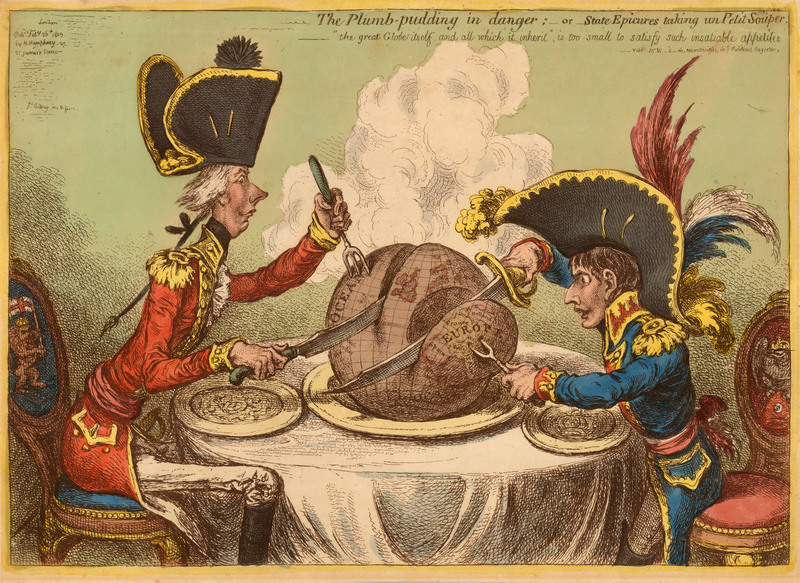 Britain and France had been at war for twelve years when James Gillray created what is now considered to be his most notable caricature – The Plumb-Pudding in Danger; – or – State Epicures taking un Petit Souper. With only a brief moment of amity between the two great European powers – the Peace of Amiens in 1802 which lasted little over a year – Britain was anxious as she anticipated an invasion from France. France desperately needed time to recuperate from the economic chaos which followed years of continuous warfare. In Britain, society was becoming increasingly restive – understanding that naval supremacy alone could not defeat the French. The Plumb-Pudding served as Gillray’s retort to the later overtures uttered by the new Emperor for reconciliation with England in January 1805. It is evident that the satirist did not share Napoleon’s fleeting optimism. He depicts the British Prime Minister William Pitt the Younger and Napoleon Bonaparte at odds – seated before a steaming plum pudding in the form of a globe – Pitt claiming the Ocean and Napoleon hungrily carving Europe for himself. Although Britain is left unscathed in the middle, her position is far from certain. The fervent opposition between naval power and land supremacy is one of the most striking features of this satire. Pitt’s fork, a trident symbol of the god of the seas Poseidon, plunges into the Atlantic paring half of the globe away – including the lucrative West Indies – reaffirming Britain’s intention to monopolise world trade and develop her colonial empire. Napoleon’s fork, a bident symbolic of Pluto god of the underworld, dives over Hanover, as his eyes fix on the homeland of the British Monarchy occupied by France since 1803. Notably, there is an uncharacteristic display of balance between the two figures. Gillray has not explicitly displayed bias in favour of the Prime Minister and there is no unequivocal display of British Supremacy. Before Pitt, a gold plate is emblazoned with the Royal Arms whilst his chair is embroidered with the Lion Rampant, and in front of Napoleon, a plate is etched with the Imperial Crown and his chair bears the Imperial Eagle clutching a liberté cap. The plumes of Napoleon’s hat have also been carefully coiffed by Gillray, to evoke the plumage of the French cockerel. The satirist’s exaggeration of the two figures serves to amplify their likenesses; rather than detract from them. The wiry Pitt is shown with his similarly thin queue of hair, whilst his prominent nose and weak chin loom over proceedings. Napoleon, the grandiose Lilliputian, perched on the edge of his seat, his mouth open with anticipation, reveals incongruously large teeth beneath his hooked nose. This neutrality might have stemmed from Gillray’s dislike of Pitt, despite being granted a secret annual pension of two-hundred pounds by the Tory Government in exchange for the creation of satires mocking the Whig opposition. Beyond the subject matter, The Plumb-Pudding is also a testament to Gillray’s talents as an artist. The rumbustious nature of Gillray’s satire, paired with his skill as a draughtsman, creates a wonderfully rich composition that maintains the clarity of his social commentary whilst encapsulating the opulence of the Regency style. Gillray’s aesthetic credo was a product of his studies at the Royal Academy and his apprenticeship to a letter-engraver; his etchings were clear and distinctive, precise of line with a boldness of colour that rendered him wholly distinct from his peers. This is a particularly fine example, embellished with superb original colour. To see more highlights from our collection, please go to our website – http://www.themaphouse.com/PrintGallery.asp – or visit us at The Map House, 54 Beauchamp Place, Knightsbridge, SW3 1NY.